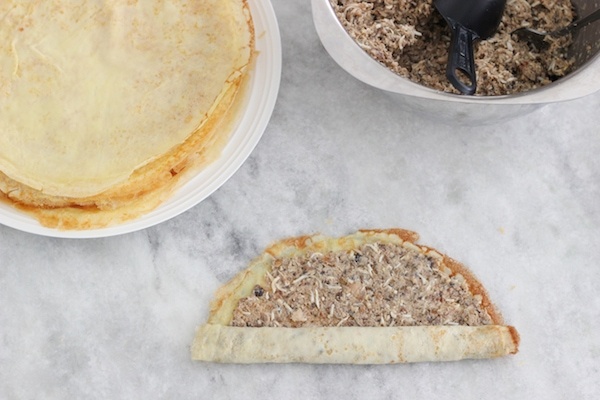 Savory crepes with a chicken and mushroom filling are such a treat. 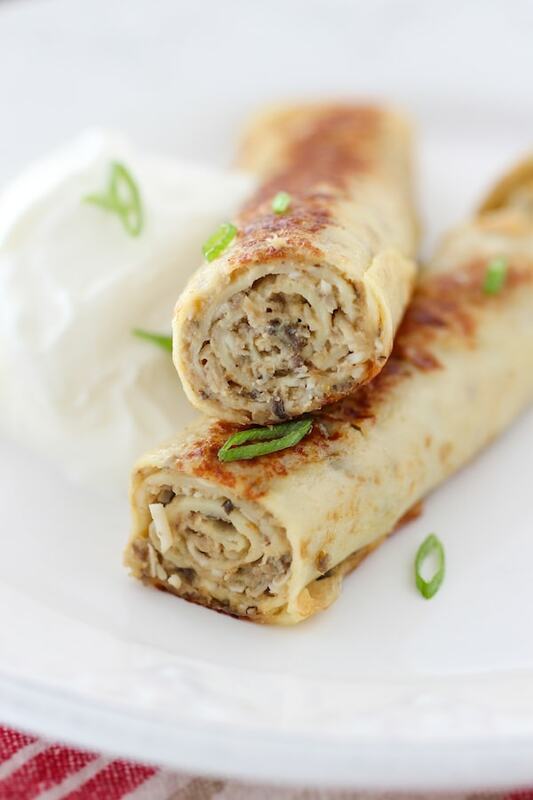 It’s a great way to use leftover chicken, and adding mushrooms, caramelized onions and hardboiled eggs adds lots of delicious flavors to the juicy crepes. 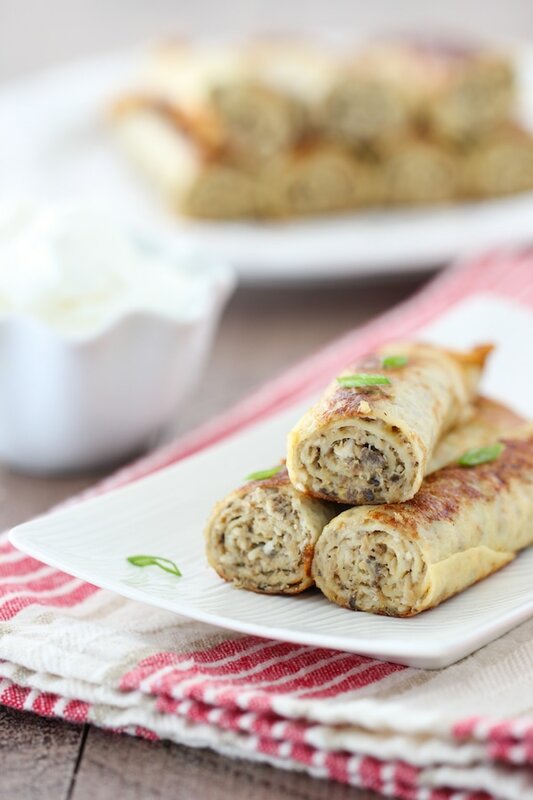 Savory crepes are so comforting for me. 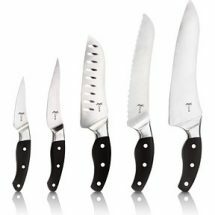 They bring me right back to my Mom’s kitchen. She used to make them all the time when we were growing up and still makes them when we come for visits. 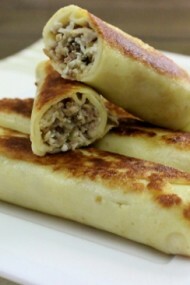 We make them from just about any meat and this time, I decided to make Chicken and Mushroom Crepes. The combination of chicken and mushrooms is one of my favorites. 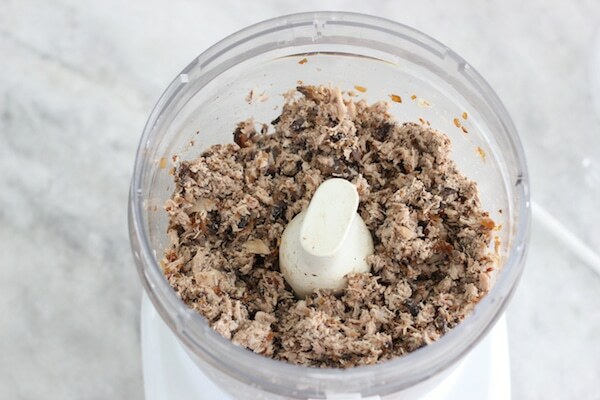 I have THREE secrets to a really delicious filling. 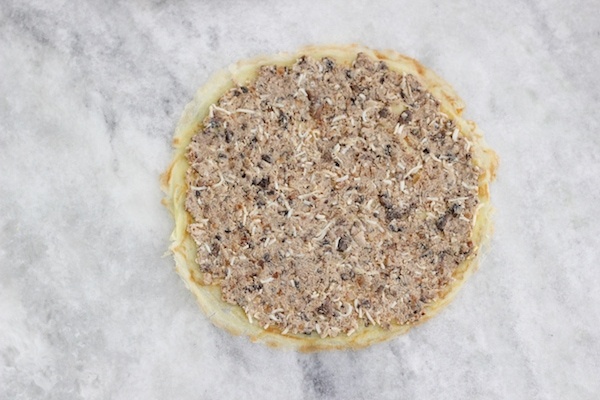 1 – use LOTS of caramelized onions, 2 – brown the mushrooms and 3 – use chicken broth to add moisture and to keep the filling from falling apart. Any time you caramelize anything, it makes the dish so much richer in flavor, so that’s what I do to the onions and mushrooms. It adds a sweetness and that wonderful umami well roundedness. 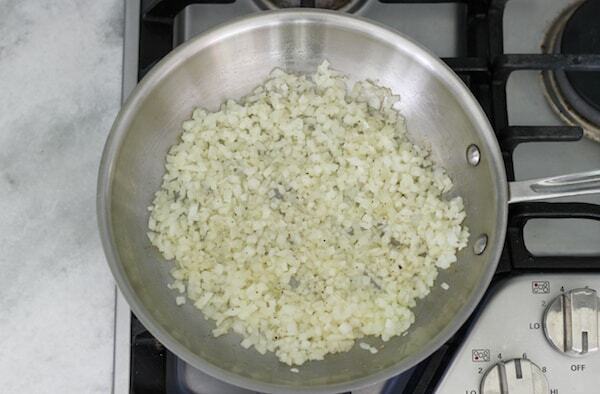 Even if your family members say they don’t like onions, chances are they won’t notice them, since they will be incorporated into the filling. They WILL notice how juicy and yummy the crepes are though. 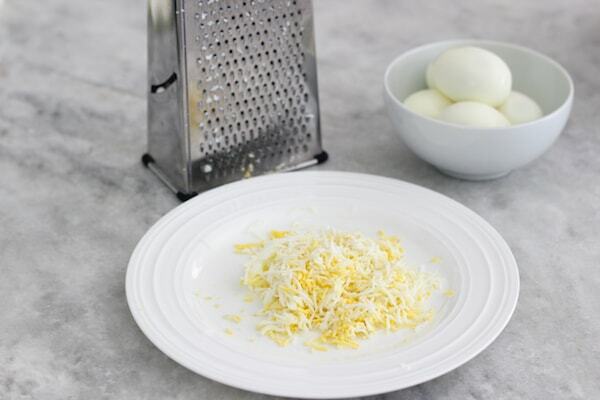 Hard boiled eggs are also a wonderful addition to the filling as well as cheese. 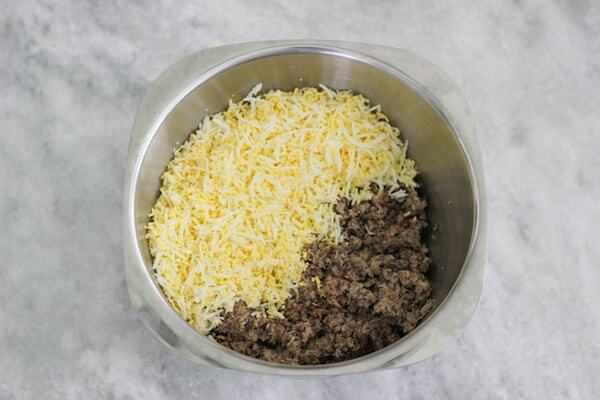 You can’t go wrong with adding cheese to almost any recipe. I often make these crepes after making a giant pot of chicken broth, which I keep in stock in my freezer at all times. You can also use a rotisserie chicken or leftovers from a roast chicken too. I use the cooked chicken for these crepes and make a big batch of the crepes as well, because they freeze wonderfully too. Any cooked chicken will work. I wrap each of the assembled crepes in plastic wrap and then put them in a large ziplock bag. 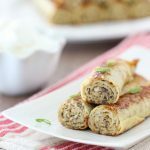 Served with a side of sour cream and garnished with some fresh herbs, these crepes are so satisfying for breakfast, lunch or dinner. 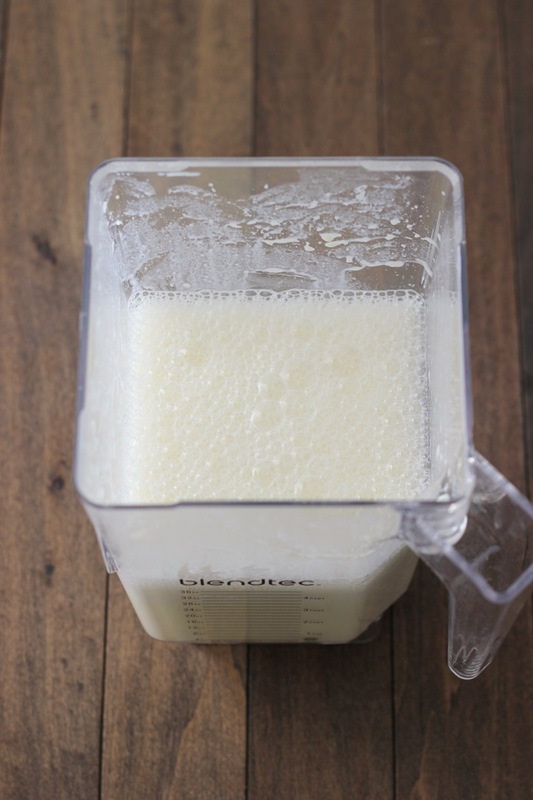 Combine all the ingredients in a blender and mix until combined. Crepe batter is best if made a few hours in advance or even overnight. Spread a bit of butter or oil in a nonstick skillet and heat until shimmering. I use a 10 or 12 inch skillet. Keep the heat on medium high. Pour in a little less than 1/4 cup batter, tilting the skillet to distribute the batter over the surface of the skillet. Heat until lightly golden, 2-3 minutes, flip and cook for about 30 seconds – 1 minute. Cook all the crepes. 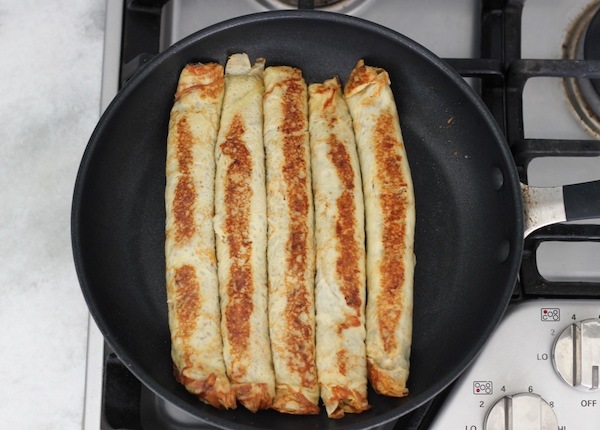 If not using immediately, stack cooked, cooled crepes and refrigerate, up to 3 days. Crepes freeze really well too. 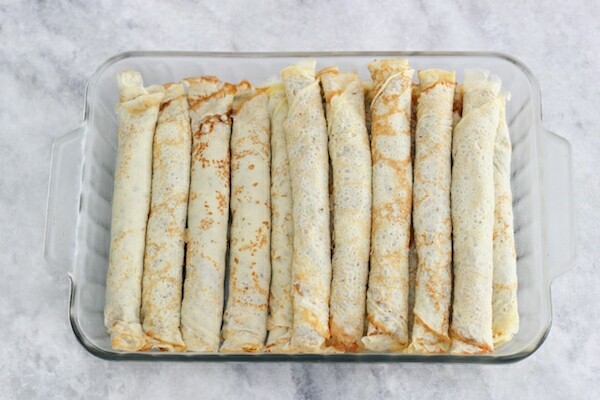 Store them with parchment paper or wax paper in between crepes, in a large freezer ziplock bag, up to 3 months. Heat the butter or oil in a skillet on medium high heat. Add the onions, seasoning with salt and pepper to taste. Cook until the onions have softened, about 5 minutes. 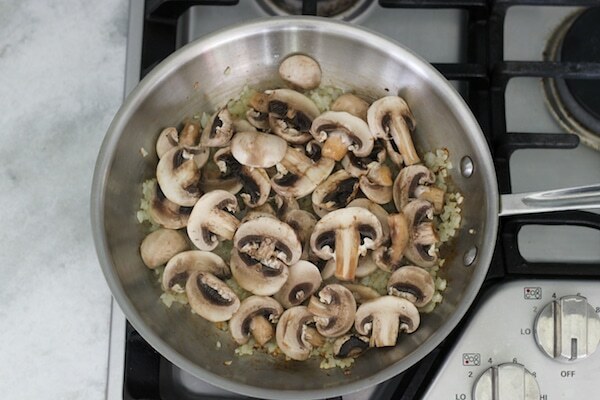 Add the mushrooms, season with salt and pepper and cook for another 5-7 minutes, until the mushrooms are tender and golden. 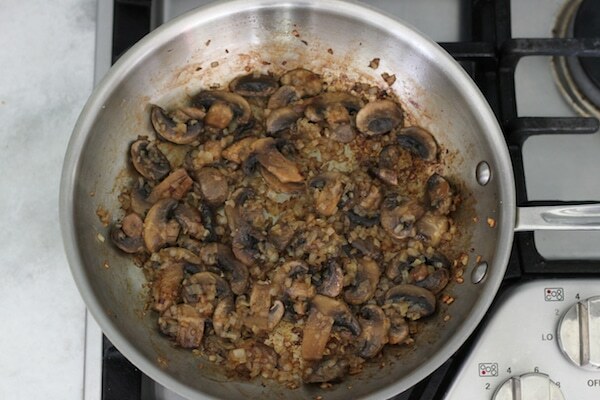 At first the mushrooms will exude a lot of liquid, but then eventually absorb it and begin to brown. Season with salt and ground black pepper, if needed. Add the grated cheese and the chicken broth. You can add more or less broth, depending on how dry/wet the chicken and mushroom mixture is. The broth will help to keep the mixture together and later on when it is cooked, will help keep the filling from falling apart and from being too dry. Place about 1/4 cup of the filling on a crepe and gently spread it out thinly over the crepe, being careful not to rip the crepes. 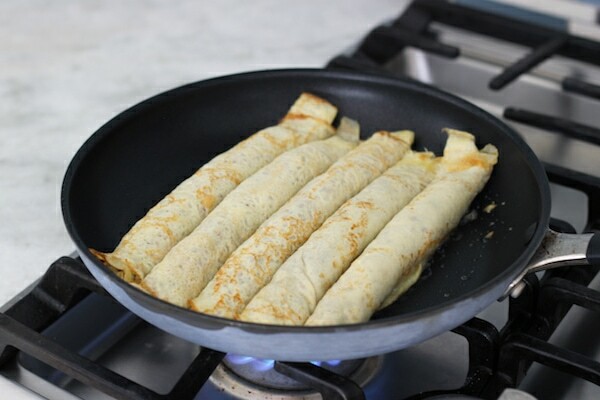 Roll up the crepe as tightly as you can. 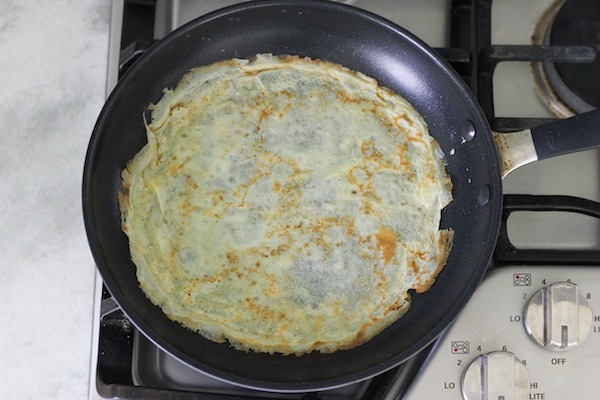 Place the filled crepe, seam side down in a large rimmed dish. Repeat with all the crepes and the filling. 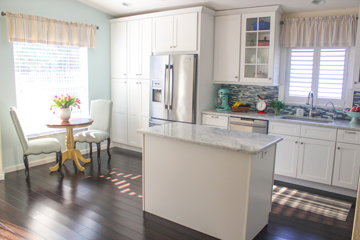 Keep the assembled crepes covered in the refrigerator for up to 3-5 days. You can also freeze the crepes for up to 6 months. Individually wrap each filled and assembled crepe in plastic wrap and then place the wrapped crepes in a large freezer ziplock bag. In a nonstick skillet, melt some butter or oil and cook the crepes over medium low heat, until golden brown on both sides and warm all the way through, about 3 minutes per side. Serve with sour cream and garnish with fresh herbs, like green onions, dill, parsley, etc. Combine all the ingredients in a blender and mix until combined. Crepe batter is best if made a few hours in advance or even overnight. Spread a bit of butter or oil in a nonstick skillet and heat until shimmering. I use a 10 or 12 inch skillet. Keep the heat on medium high. Pour in a little less than 1/4 cup batter, tilting the skillet to distribute the batter over the surface of the skillet. Heat until lightly golden, 2-3 minutes, flip and cook for about 30 seconds – 1 minute. Cook all the crepes. 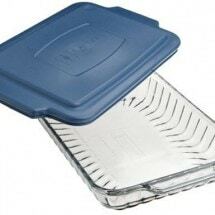 If not using immediately, stack cooked, cooled crepes and refrigerate, up to 3 days. 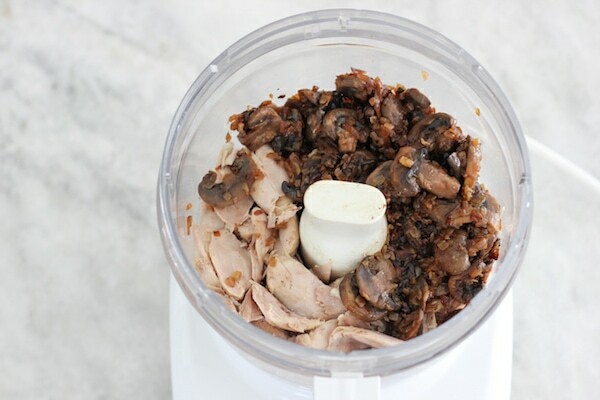 Add the cooked chicken, the onions and mushrooms to a food processor and pulse a few times until it’s all evenly mixed in very small pieces. You don’t want it to be a puree, but the chopped up chicken and mushrooms should be pretty tiny. Transfer to a large bowl. 1. 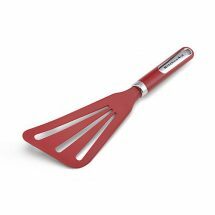 Can we use the crepe batter for sweet filling? 2. Doesn’t the crepe becomes soggy once filled in n kept in the fridge? 3. Hard boiled eggs tend to have a strong sulphur smell. Do that go unnoticed? No, the crepes do not become soggy in the fridge – the filling is not wet. I don’t think the hard boiled eggs have a strong smell, but you can omit them if you want to. I love the flavor that they add to the crepes, but it is optional. You can use a blender, Nadia, but be careful that you don’t blend it into a paste. 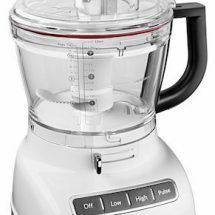 Using a food processor gives you more control and is much better for jobs like this one. Blenders work better for more “liquidy” substances. 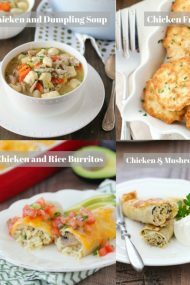 I love all the recipes I’ve tried from your site and I’m a big fan of your blog. 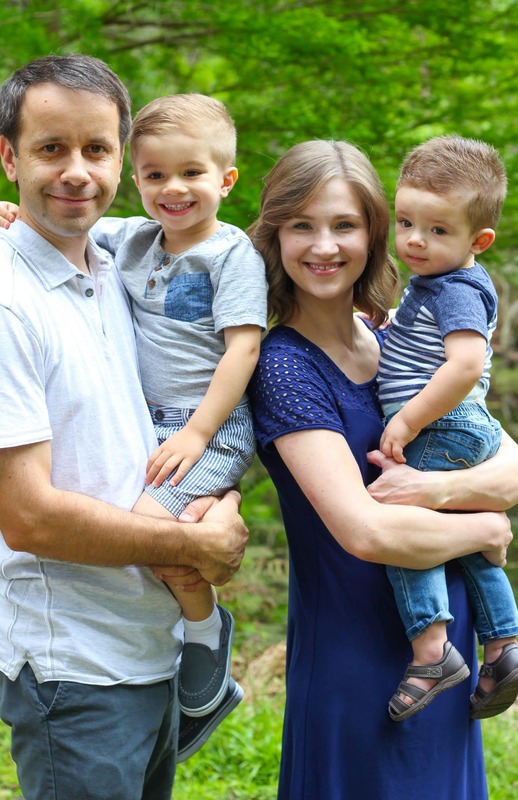 Always excited to see a new post! 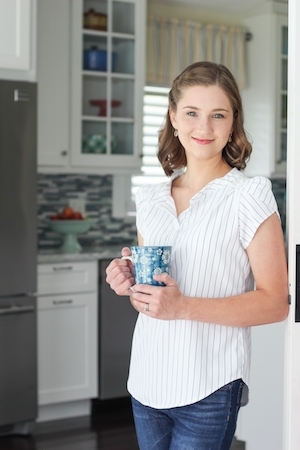 Thank you for visiting my website and trying the recipes, Jenny. I’m always so happy when the food we love is enjoyed by other families. I would recommend using cooked chicken meat for this recipe. 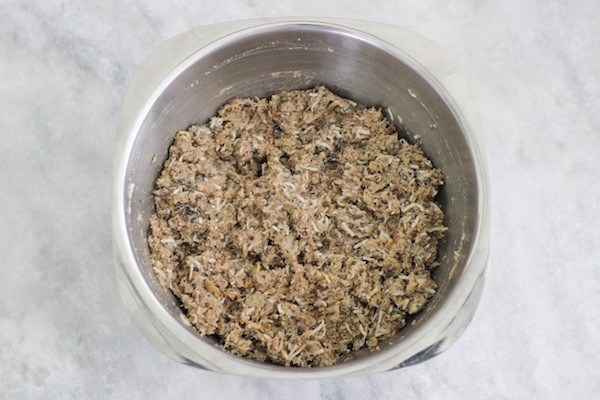 If you do want to use ground chicken, brown it in a skillet first and use ground meat from dark meat, not just chicken breast, otherwise the meat will be very dry. 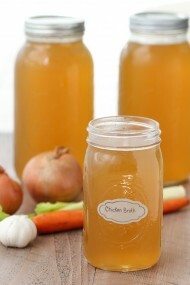 I have been trying to figure out some new recipes to try this fall and winter and this will be at the top of the list. Just sounds delicious and like something I would enjoy often. Husband is picky eater and I know he would like it as well. Do the assembled, frozen crepes have to be de-frosted before sauteeing? No, you can cook them on low heat in a skillet, it will just take a little bit longer. How do you defrost frozen crapes? Or you warm them up frozen? 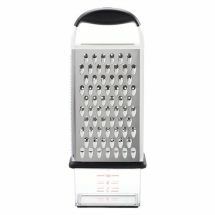 You can defrost them, but you can also reheat them while they are still frozen. I put them in a skillet with a bit of butter and cook them on low heat, covered, until they are completely defrosted and heated all the way through.